Parents of prospective students got a first look at the new K1 dual language Haitian Creole program at the Mattahunt school on Wednesday night. 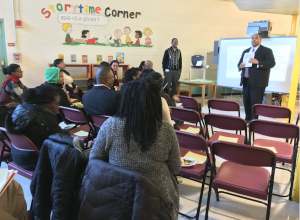 The program, which would roll out with the opening of the new Mattapan Early Elementary School for the 2017/2018 school year, will consist of one class in which one-third of the students speak Haitian Creole as a first language and at least one-third speak English. These 25 students would enter a class schedule program in which 70 percent of the instruction time is taught in Haitian Creole and 30 percent in English. Boston Public School officials say it is likely the first two-way immersion Haitian Creole dual language preschool program in the country. 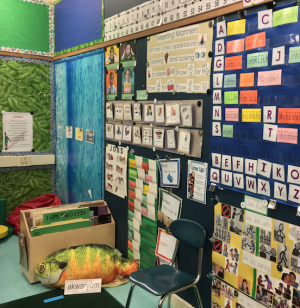 With students struggling to immerse themselves in a new language, especially the 4-year-olds the program is geared toward, a patient and engaging instructional staff is paramount. The program would last a normal K1 School day, filled with group activities, storytimes, melded math and language lessons, and physical education interspersed with the requisite meals, snack times, and rest periods. 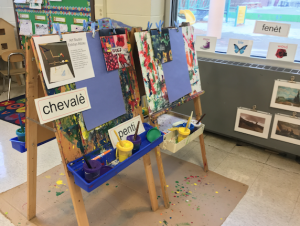 Visitors explored a model classroom, which would look familiar to any parent with young children with one notable exception: cards with words in Haitian Creole tagged objects around the brightly-colored area. “Bifèt” hung on a cabinet, “tab” sat on a table, “akwaryòm” lay beside a large plush fish. The classrooms will also have English labels, instructors said. Edyne Lalanne, 31, said she registered her 3-year-old daughter for the K1 dual language program. The program seemed like a strong way to get the language ball rolling, Lalanne said. There will be a later open house or orientation just for enrolled families. Michel DeGraff, with the MIT linguistics department, told the group that there are myriad advantages to choosing a Haitian Creole dual language program for their young children. With a higher concentration of Haitian residents in Mattapan, speaking Haitian Creole can connect children with the community, he said. Demand for Haitian Creole speakers is rising in several fields. Though historically maligned as a more difficult language or inferior to languages like French or Spanish, DeGraff said attitudes are changing. Phonetically, it is a simpler language to learn than French, he noted. Just the pronunciation of the sound /o/, as in “oh,” is written in one clear way in Creole. French, however, has 40 different ways to spell that same sound. Mattapan resident Sarema Monroe, 25, attended the meeting to consider the program for her 4-year-old daughter. The presentation helped assuage several concerns she had regarding her English-speaking daughter’s participation in the dual language course. Monroe does still have some concerns about the 70-30 teaching ratio for predominantly English-speaking students. One parent asked officials if the program would be looking at a longer-term plan, especially as it hopes to expand to K-5 or K-6 in the future. She also wanted to know if the administration would be encouraging and welcoming to parent engagement. The Boston School Committee voted that evening on a $1.061 billion Boston Public Schools budget, which could rise another $20 million after employee collective bargaining. The 5-2 vote sends the budget to the Boston City Council for approval. The proposed budget notes a $6 million complete cut to the Mattahunt Elementary School, which is closing down on June 30 and immediately re-opening as the Mattapan Early Elementary School on July 1, budgeted for $3.9 million.